Hello, i tried to compile latest source from git (e8da364e at the time of writing) from master branch and got trouble making it detect my XBOX360 controller (While the 4.0 stable does without problems). I think everything else works (i do have sound, D3D, animations doesn't lag, but can't play as the controller isn't detected) and only error VS2013 reported is missing QTDIR (Well, i don't have the Qt SDK installed as it wasn't stated as required on the readme). I Didn't change any flags from the solution file. I attached my build on the thread, I don't really know where to look to pinpoint why only this part isn't working. InputCommon and libusb-1.0 were compiled successfully. I don't know if i did something wrong or if I just had bad luck pulling source at the wrong moment and should open an issue for this. My build try is attached to the post in case someone wish to try (but I doubt it'll work for others), build target architecture was x64 (don't know for flags used as I didn't even bothered looking at what was set on the solution file, left it as is). Why didn't you just upload the build as one rar on another file host if it was an issue attaching it here? You can compile Dolphin without qt by simply not building it. 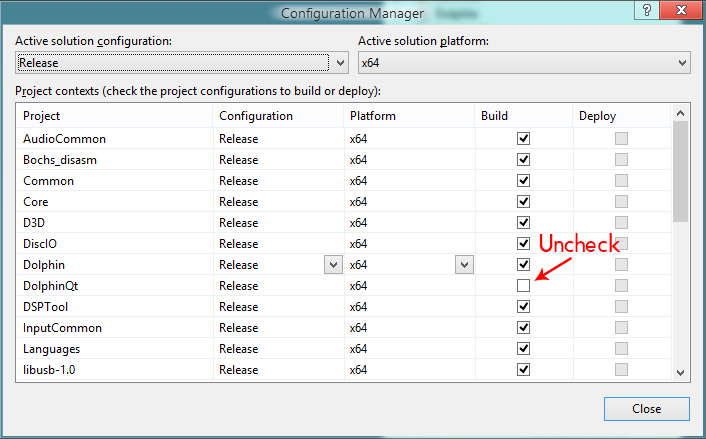 Go to the configuration manager and uncheck it. Thanks for your assistance on disabling DolphinQt building, but excluding it doesn't help for the controller which is the main problem for me here. Hello, i tested with current latest master (date of this post) and i'm still unable to make usb controllers work with my self-compiled binary, only mouse and keyboard are detected by the software, i excluded Dolphn Qt from compilation. If someone could give me direction on how to troubleshoot that it would be nice. That's weird. Works fine here with Windows and Linux build instructions on my computer. (12-03-2014, 09:02 PM)JMC47 Wrote: That's weird. Works fine here with Windows and Linux build instructions on my computer. That's indeed weird, are you building for windows from windows or you're cross compiling from linux ? May I be missing something in my build environment ? I have the same problem with custom build from Tino and he mentioned something missing from a recent merge, maybe i'm not pulling the correct branch ? I'm pulling straight from master. Maybe it's something missing from your build situation? Like Xinput or something? (12-04-2014, 06:23 AM)JMC47 Wrote: Maybe it's something missing from your build situation? Like Xinput or something? Wouldn't it result in a failed build if it was missing ? I do have a XInput XInput2 XInputFilter etc with Dolphin's source from the git. I do have XInput.lib on my computer.